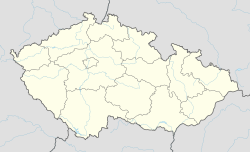 Karviná (Czech pronunciation: [ˈkarvɪnaː] ( listen); Pols: Karwina, Pols pronunciation: [karˈvɪna] ( listen), German: Karwin) is a ceety in Moravie-Silesie Region o the Czech Republic, on the Olza River. ↑ "Partnerská města". Statutární město Karviná. Retrieved 2009-10-09. This page wis last eeditit on 3 Februar 2019, at 18:48.